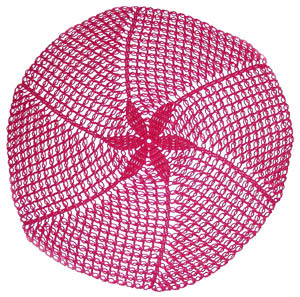 This circular shawl is designed around a simple, yet bold flower that extends out into a fun swirl. The open stitches make the Yuet Shawl lacy and perfect for draping over your shoulders. This pattern is free for all Premium Pattern Members. By purchasing this pattern or becoming a Premium Pattern Member, you will be supporting Crochet Spot in purchasing supplies to create the tutorials and patterns you love on this site. Your support is greatly appreciated! If you need help crocheting your Yuet Shawl, let me know and I’ll be happy to help! 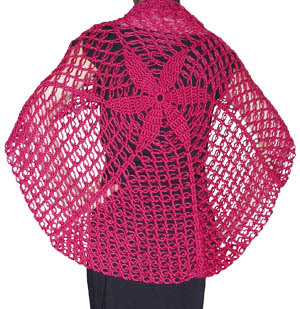 This entry was posted on Friday, December 4th, 2009 at 4:57 PM by Rachel Choi	and is filed under Best Crochet Patterns. You can follow any responses to this entry through the RSS 2.0 feed. You can leave a response, or trackback from your own site. That’s beautiful, Rachel! I can’t wait to finish what I’m working on to start this shawl! By the way this website really feels like home. I have learned so much and can’t get enough! Thanx so much for creating it. Hey Rachael! I’m glad you like my site! I come up with patterns by deciding what I want something to look like and then thinking about what stitches would work well with it. That looks so cool, I think I might try it.